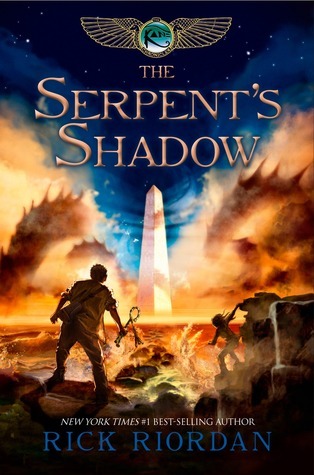 Rick Riordan’s The Serpent’s Shadow is the best of the Kane Chronicles trilogy. Anophis, the snake god of Chaos, is on the loose and will destroy the world in three days, and siblings Carter and Sadie Kane must stop him and restore Ma’at (order) to the world. Carter and Sadie have grown quite a bit since their first appearance in The Red Pyramid — Serpent’s Shadow begins with the pair understandably apprehensive, but definitely in charge of the fight against Anophis. They manage a school for magicians, training even kindergarteners to help in the upcoming battle, while still making sure the magician students attend regular school classes. The Kane Chronicles have never captivated me as much as his Percy Jackson and Heroes of Olympus books have. I’m not sure if it’s just because I find the Greek/Roman gods, or because the format of the stories make the Kane Chronicles a bit more slanted towards children, stylistically. For example, because Kane Chronicles heroes Carter and Sadie narrate the story by dictating it into a tape, we have regular interjections, e.g. of one complaining that the other was pinching him/her. Regular sibling horseplay, and sure to elicit a laugh from eight-year-olds when read out loud, but a bit too much played for laughs. There’s quite a lot packed into this book, and with so many god and mortal characters and such a big task (how to stop an unstoppable snake god), Serpent’s Shadow gets right into the action and assumes you remember the previous two books. It does get a bit confusing at times, and a bit difficult to care, really, about events you know are momentous because the narrators say so. Still, once Sadie and Carter figure out a plan and set off after Anophis, the story becomes more exciting. The stakes are really high in Serpent’s Shadow — Carter and Sadie admit they’re not sure their plan will work, and worse, their plan will most likely require both of them to sacrifice their lives. Even their love interests have major sacrifices to make, and the gods can only help so much. The only thing perhaps that bothered me is that the consequences of Anophis taking over the world weren’t really explained, beyond a generic idea of the world ending. So we know how much Carter, Sadie and their team are willing to sacrifice to stop Anophis, and we know it’s important, but mostly just because they tell us so, which lessens the significance of their mission somewhat. There is a great moment where Carter realizes Anophis’ motivation and, for a few seconds at least, understands Anophis completely. That gave dimension to the villain, and added depth to the story. I like how Riordan handles his female characters. Carter may be the designated leader, but both Sadie and Zia are really strong leaders as well, and they play even bigger roles in the battle. The romantic subplots were also interesting, at certain points more interesting than the main story. Carter’s feelings for Zia cause him to make an absolutely idiotic decision at one point, which I thought unnecessary and too convenient a plot device (he’s really not that stupid), but overall, I like the romance in the book. I liked the somewhat creepy twist in the Carter/Zia love story, but I personally found the resolution of the Sadie/Walt/Anubis love triangle rather disturbing. Overall, a solid book. The best of the Kane Chronicles, and certainly an epic way to end the series. Thanks to Hachette Book Group Canada for a finished copy of this book in exchange for an honest review. This entry was posted in Book Reviews and tagged 50BookPledge2012, Fiction, HBG Canada, YA by Jaclyn. Bookmark the permalink.